If you are looking for ways to add some excitement and fun to your birthday parties, summer soirees or picnics, why not order a snow cone machine rental? It’s the perfect snack for the season, and no one can resist eating them. Adding a snow cone flavor buffet to your events is a great way to give everyone a cool and tasty treat to cool off with. 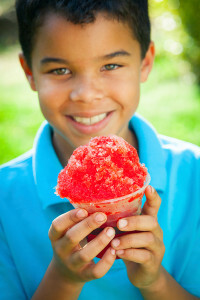 Snow cones are not just great for snacking, they can also be used to help liven things up. Since they are a treat that all ages can enjoy, there aren’t any limitations as to how you can use them in your event. If you need some game ideas for your party or summer party or event, here is where having a snow cone machine onsite can be handy. With over 94 flavors to choose from, the combinations are endless. Add some excitement to the festivities by having everyone guess what flavor snow cone they are eating. The person that guesses the most correct flavors wins a prize. Of course, don’t forget to have everyone take frequent breaks to avoid getting that dreaded pain sensation that comes from eating frozen treats too fast (brain freeze). Anther fun and exciting way to use your snow cone rental in Katy is to have everyone take turns creating different flavors. Pick several people to act as judges to choose the best tasting flavors. Although this is a really great way to get everyone involved in the festivities and hydrated, it can also be very messy if it’s very hot outside. Plan a relay race and for each lap that is ran, have everyone eat a snow cone. The person or team that finishes the most laps or eats the most snow cones wins. Or, up the ante even more by incorporating a bunch of physical tasks, such as spinning around in circles, doing the cabbage patch dance or doing some jumping jacks after eating each snow cone before continuing on to the next lap. It’s hot, and the summer breeze is making it really hard for everyone to stay cool. A fun way for everyone to cool off is to play topsy-turvy snow conesicles. Participants stand on their heads and try to eat a snow cone without falling over. Standing on one’s head can be pretty tricky, so there is always the option of having participants play this game in the wheelbarrow position with a teammate. Reserving your snow cone rental in Katy is fast and easy. Everything you need is delivered right to your doorstep. All rental equipment is clean and sanitized prior to delivery to ensure that everything is safe and ready for immediate use. Planning a party or summertime get together has never been easier when you add a snow cone rental machine to your itinerary. It’s a quick and affordable way to add some unique fun and excitement to any event without going to extreme measures to purchase any supplies. You rent what you need and at the end of your event, everything gets returned to the rental company.